Description: MY FIRST GEVO! Its a crappy shot, but hey, it was worth it. Description: BNSF7674 enters the 7.8 mile long Cascade Tunnel. Photo taken from the top of the west portal of the Cascade Tunnel. Description: Leading a southbound approaching Moody. Description: Just south of Celilo Village. Description: ES44DC 7674 on the head end of a grain train at Saginaw. 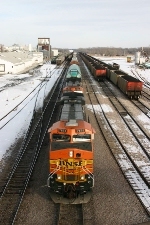 Description: Burlington Northern Santa Fé. 7915 eastbound passing through the yard and approaching the 1st Ave overpass. Description: Sitting outside the diesel shop. Description: BNSF WB Manifest Decending a 1.8% Grade On Marias Pass. Description: BNSF WB Marias Pass. 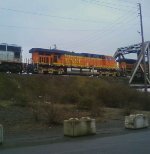 Description: BNSF WB Manifest Decending a 1.8 % Grade. Description: BNSF WB Snow Shed Marias Pass. Description: BNSF WB Manifest Is Nearing East Glacier.